Simplified maps of percent shale of the Navajo Sandstone over the entire study area were presented by Stanley and others (1971) and Kocurek and Dott (1983). 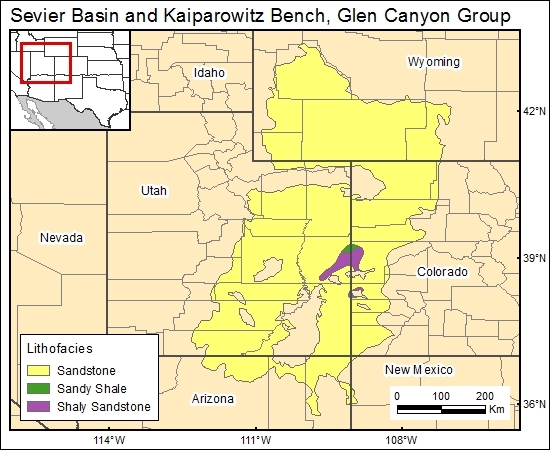 Freethey and Cordy (1991) displayed a general lithofacies map of the Navajo Sandstone in eastern Utah, from which shale percentages were derived. Freethey, G. W., and Cordy, G. E., 1991, Geohydrology of Mesozoic rocks in the Upper Colorado River Basin—excluding the San Juan Basin—in Arizona, Colorado, New Mexico, Utah, and Wyoming: U.S. Geological Survey, Professional Paper 1411-C, 118 p.
Kocurek, G., and Dott, R. H., Jr., 1983, Jurassic paleogeography of the central and southern Rocky Mountains region, in Reynolds, M. W., and Dolly, E. D., eds., Mesozoic paleogeography of the West-Central United States: Rocky Mountain paleogeography symposium: Denver, Rocky Mountain Section, Society of Economic Paleontologists and Mineralogists, v. 2, p. 101–116. Stanley, K. O., Jordan, W. M., and Dott, R. H., Jr., 1971, New hypothesis of early Jurassic paleogeography and sediment dispersal for western United States: American Association of Petroleum Geologists Bulletin, v. 55, no. 1, p. 10–19.